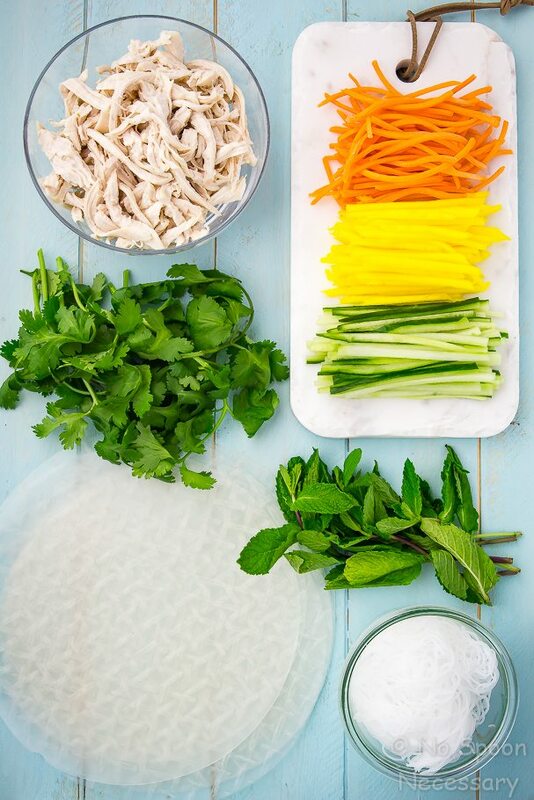 Tender coconut poached chicken, crisp veggies and sweet mango are rolled up with fresh herbs in these easy summer rolls. Dip in a delicious peanut sauce for a perfect summer meal or party appetizer. 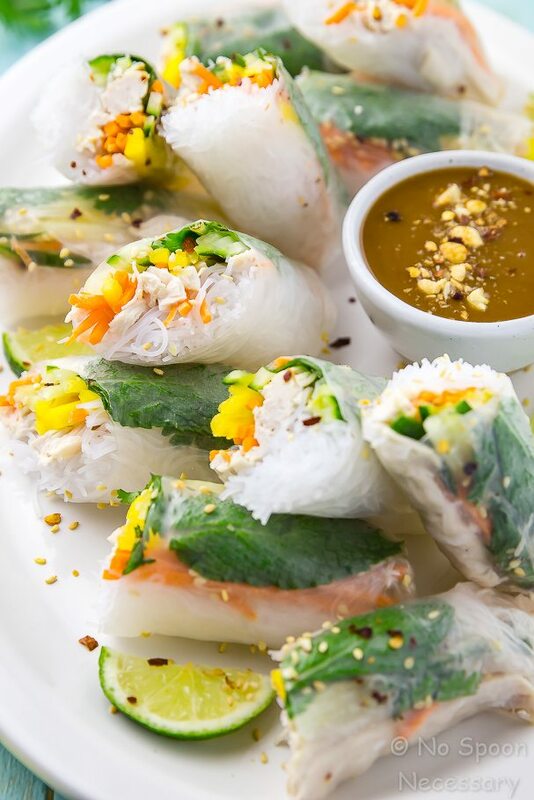 Coconut Chicken and Mango Summer Rolls, AKA Super fresh summery goodness jam packed into portable, little rolls. Tender, succulent coconut poached chicken; cool, crisp, crunchy veggies; juicy, sweet mango and slurpable noodles all snugly rolled up in a soft rice paper wrapper. And the sauce! OMGeee. THE creamy-dreamy, salty-sweet, peanut buttery SAUCE! Coconut Chicken Mango Summer Rolls + Peanut Sauce = ALL the heart-eye emojis the world has to offer. The amount of time the chicken will take to poach depends on the thickness of your chicken breasts. For quicker cooking, lightly pound your chicken breasts to an even thickness before poaching! Before you start rolling, get all of your ingredients prepped! Cut all the veggies, shred the chicken, tear the herb leaves from the stems, clean the cutting board, make the sauce, fill a large bowl with water… prep it all! Having everything all set up (mise en place) will make the entire process much more pleasant and efficient. Make sure your bowl of water for softening the rice paper wrappers is room temperature. I have found warm water makes the wrapper too sticky and causes it to tear easily. The bow of water should be large and shallow enough for the wrappers. A pie pan or similar shaped bowl works well! Make sure you are only soaking the rice paper wrapper until it is JUST tender! Keep the filled spring rolls under a clean, damp tea towel to prevent them from drying out as you are rolling the remaining rice paper rolls. The summer rolls are best enjoyed immediately, however they can be made up to 2 hours in advance. Keep them tightly covered in plastic wrap at room temperature. You can serve these rolls plain, or with whatever dipping sauce you like. I recommend Peanut Sauce, but Sweet Thai Chili Sauce is also quite delicious. You can use store bought peanut sauce, or you can make your own. I’ve included instructions to make your own in the recipe below. If making your own peanut sauce, be sure to adjust the taste and consistency to your own liking. Add more honey for sweetness, vinegar for sourness, or if you like things spicy, add a drizzle of sriracha. If you want a thinner sauce, add a bit of water until desired consistency is achieved. Poach the chicken: Add the coconut milk, fish sauce, lime juice, and 1 teaspoon sea salt to a medium sauce pan and whisk to combine. Bring the contents to a boil over medium heat and add the chicken. 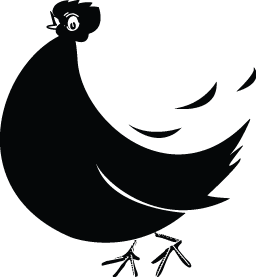 Reduce the heat to low, cover, and cook for 15-20 minutes*, or until the chicken is cooked through, turning the chicken over ½ way through cooking. Remove the chicken from the pan, reserving ½ cup of the coconut milk mixture. Let the chicken cool completely, and then use 2 forks to completely shred the chicken. Transfer the chicken to a bowl and toss with ¼ cup of the reserved coconut milk mixture. Taste and adjust for seasoning with salt and pepper. Add remaining reserved coconut milk and toss again if desired. To assemble the spring rolls: Soften a sheet of rice paper by carefully dunking it in a shallow bowl of warm water for 20-30 seconds, or until soft. Remove from the water and place on a clean work surface. Blot the rice paper with a paper towel to remove excess water. In the center of each rice paper wrapper, add a small mound of vermicelli noodles, shredded chicken, carrots, cucumber, mango, cilantro, mint and sprinkle with a pinch of red pepper flakes. Fold the bottom edge up over the filling, using your fingers to carefully tuck the filling in. Then, fold the 2 sides over top to secure the filling, then carefully and tightly roll up each spring roll. * Repeat with remaining rice paper wrappers and filling ingredients. To serve: Place spring rolls seam-side down on a platter and serve, or cut them on a diagonal and serve. Enjoy! 2. Before you start rolling, get all of your ingredients prepped! 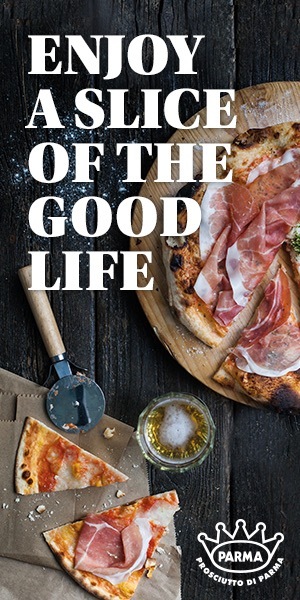 Cut all the veggies, shred the chicken, tear the herb leaves from the stems, clean the cutting board, make the sauce, fill a large bowl with water… prep it all! Having everything all set up (mise en place) will make the entire process much more pleasant and efficient. 3. Make sure your bowl of water for softening the rice paper wrappers is room temperature. I have found warm water makes the wrapper too sticky and causes it to tear easily. The bow of water should be large and shallow enough for the wrappers. A pie pan or similar shaped bowl works well! Make sure you are only soaking the rice paper wrapper until it is JUST tender! 4. Keep the filled spring rolls under a clean, damp tea towel to prevent them from drying out as you are rolling the remaining rice paper rolls. 5. The summer rolls are best enjoyed immediately, however they can be made up to 2 hours in advance. Keep them tightly covered in plastic wrap at room temperature. 6. Adjust the peanut sauce for taste and consistency to your own liking. Add more honey for sweetness, vinegar for sourness, or if you like things spicy, add a bit of sriracha. If you want a thinner sauce, add a bit of water until desired consistency is achieved. If you don't have a food processor or blender, you can easily make the sauce in a small bowl, just finely dice the garlic and whisk everything together. 7. If you make the peanut sauce in advance and store it in the refrigerator the sauce will become thick!! Just whisk in a bit of water to loosen it up.